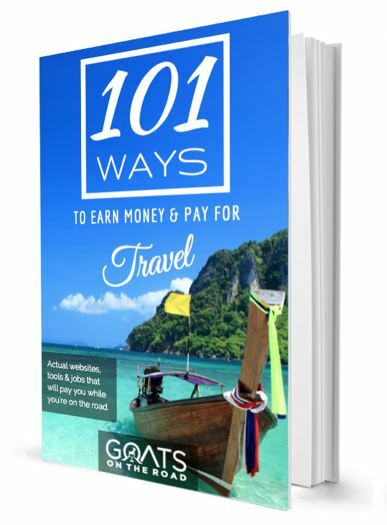 When our trip through Central Asia was coming to an end, we started thinking about the 2.5 month gap we had between being in Canada for Christmas and our pet-sitting job in Grenada. 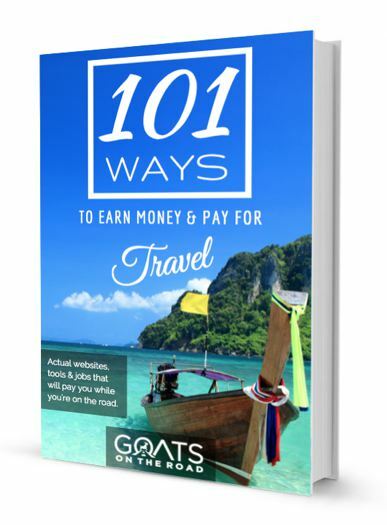 We both agreed that our recent trip through one of the least touristy regions in the world was not only adventurous and exciting, but at times, exhausting. What actually happened was that we arrived in Canada and started reading about all of the amazing places in the Yucatan Peninsula. 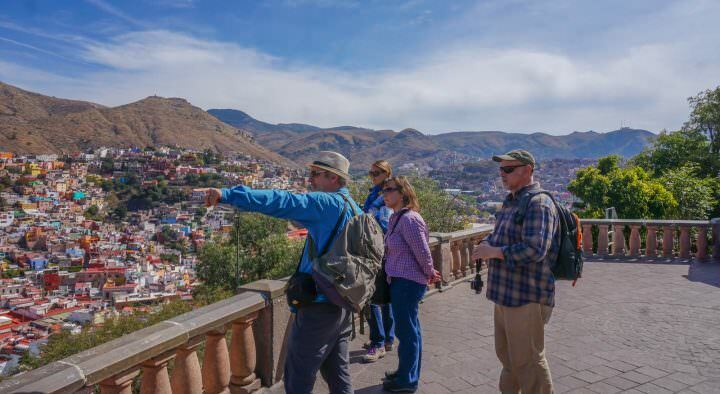 How could we go to Mexico and only see one city? Our interest in this southern country was piqued. It may not have been two-and-a-half months as originally planned, but we did visit Merida, for 8 wonderful days, and it turned out to be one of the best places to visit in Mexico. We explored, walked, drank, ate and danced our way through this city. 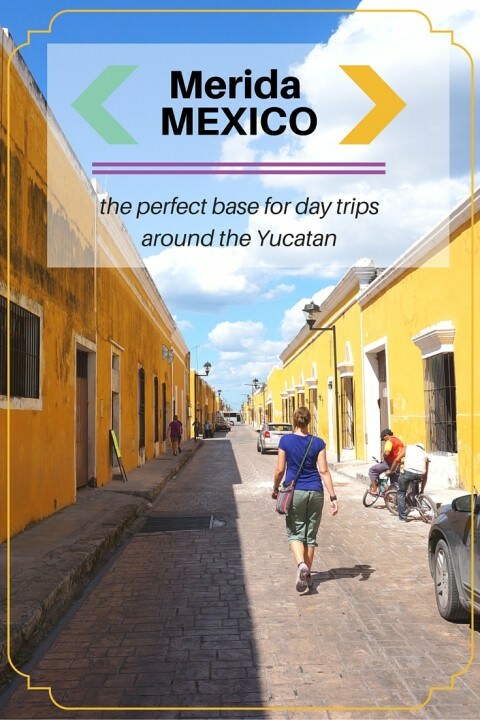 For a comprehensive, 17,000 word guide to Merida, make sure to check out Merida, Mexico: Ultimate Merida Travel Guide, but for now, here’s our (shorter) list of the top things to see & do in and around Merida! Towering at 42 meters high and dating from 1598, this is the oldest cathedral in the Americas! This is the site of a previous Mayan Temple, which was torn down by the Spanish in order to build this Cathedral. The interior, although lovely, was stripped by peasants during the Mexican Revolution and therefore is quite bare. Make sure to have a look during the day, but also at night when the Cathedral is beautifully illuminated. Although this building houses the offices of the State’s Executive Government Tourism Board, this is not a typical Government office. Adorning the walls of this green coloured building are massive murals painted by local artist Fernando Castro Pacheco. His paintings took 25 years to complete and each one portrays a period in Mexico’s history, including the interaction between the Mayans and the Spaniards. This theater was the first built in Merida and is said to be one of the most important in all of Mexico. If you’re not a fan of ballet, opera or symphonies, just go and have a look inside. 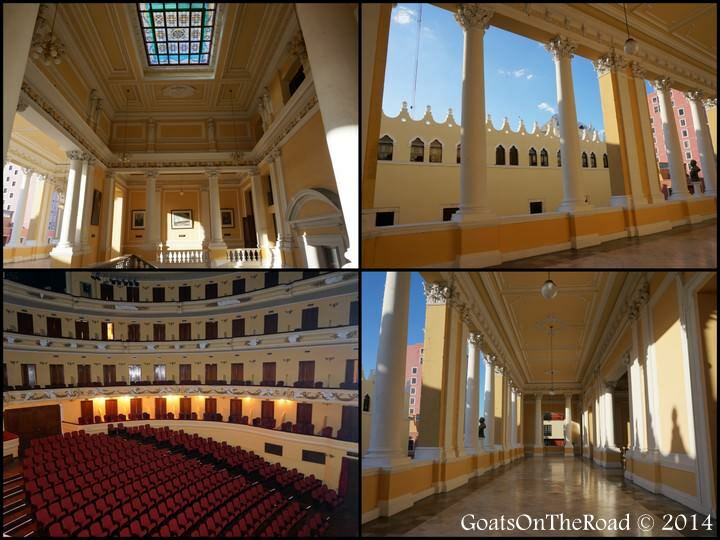 The architecture here is gorgeous and with an audience capacity of 700, it’s definitely a site to see. On Thursdays to Sundays from 9:00pm to 2:00am, Calle 60 up to 55 are closed off to traffic. These 5 blocks become wonderfully void of cars and pedestrians can stroll around peacefully looking at the churches, squares and other sights. During this time, many restaurants and bars put their tables and chairs out on the streets and some have live music playing. 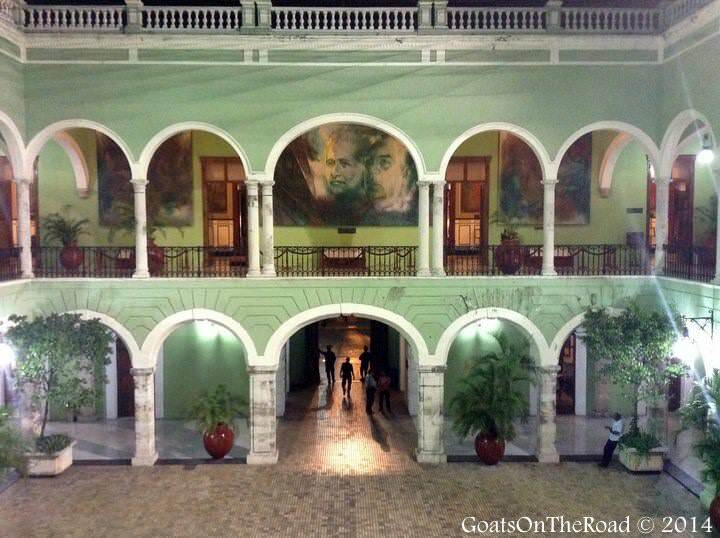 A must-do while in Merida! 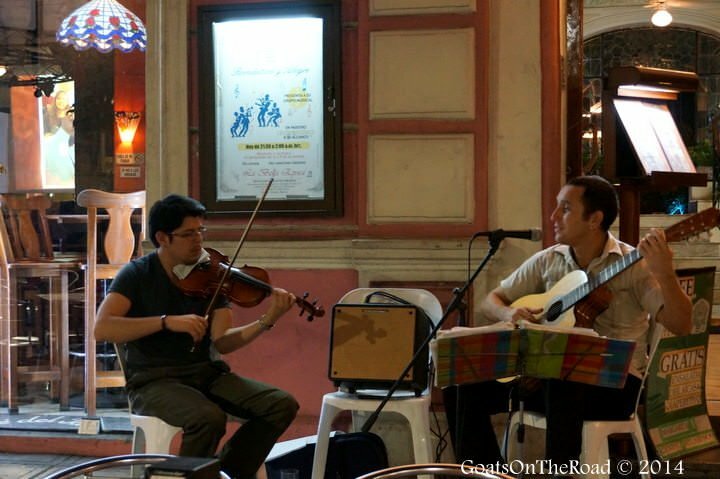 Enjoying dinner on the street while listening to live music is a must! This colourful city is only about 70 km from Merida and is a great place to visit for a couple of hours. As you probably guessed, most of the buildings here are painted yellow! It’s also known as the City of Hills, but in reality, the hills are actually piles of rubble left over from the ancient Mayan Temples that used to stand here. Clamber up to the top of places like Kinich Kokmo for great views over the city. Make sure to visit the Izamal Convent and eat at Kinich El Sabor de Izamal, a great restaurant serving traditional dishes from the Yucatan. 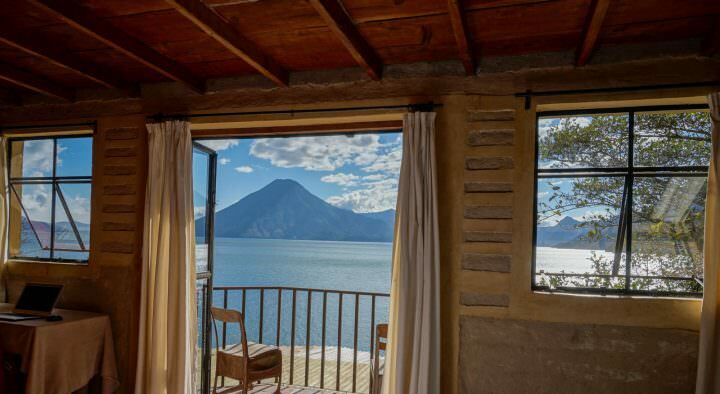 There’s no better place to escape Merida’s relentless heat and noise. 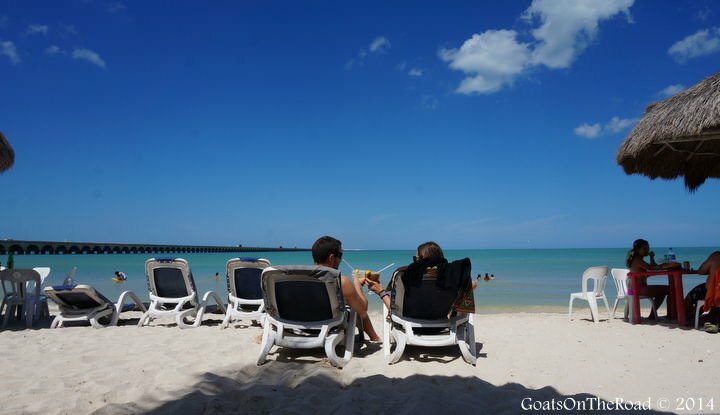 Located on the Gulf of Mexico, this fishing town is only 30 minutes from Merida! There are local buses going to and from here all day, for only 12 pesos/person/per way. After strolling down the promenade, grab a lounge chair at one of the many beach-side bars and enjoy the perfect views of the water…with a margarita in hand. 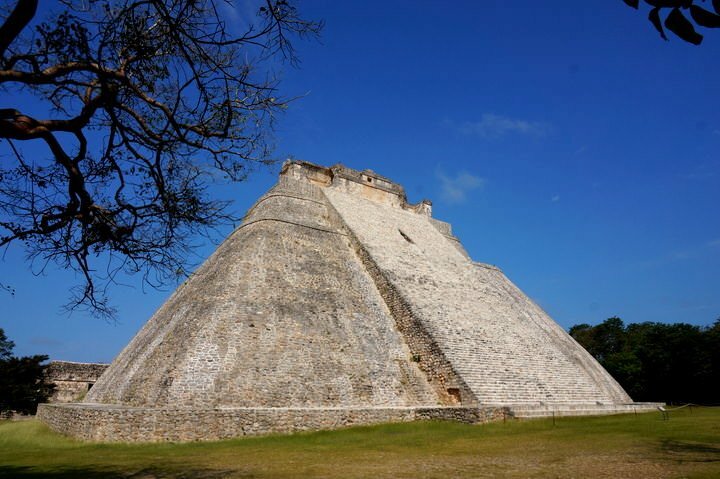 The Unesco World Heritage Site of Uxmal is in immaculate condition. The ruins here are unique compared to the other Mayan sites in Mexico. This architecture is Puuc Style, with rounded edges as opposed to square, smooth low walls and many masks of the Rain God, Chaac, carved out of stone. Dominating the center of the ancient Mayan City of Chichen Itza, stands the 30m high El Castillo Pyramid, which is the actual Wonder of the World. Even though this is a Wonder, we personally think that the ruins at Uxmal were equally, if not more, impressive! Make sure to get here early to avoid the swarms of tourists that descend on this site daily and also the relentless heat! The site is open from 9:00am to 5:00pm, the entrance fee is 204 pesos for foreigners. 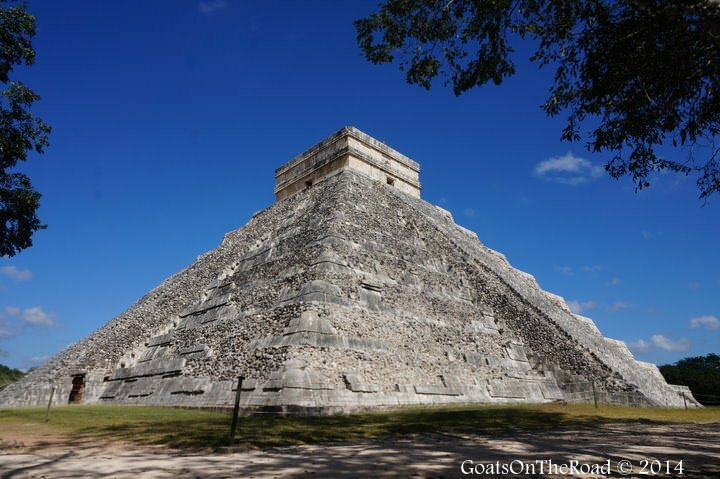 The towering Kukulkan Pyramid at Chichen Itza, a Wonder of the World! 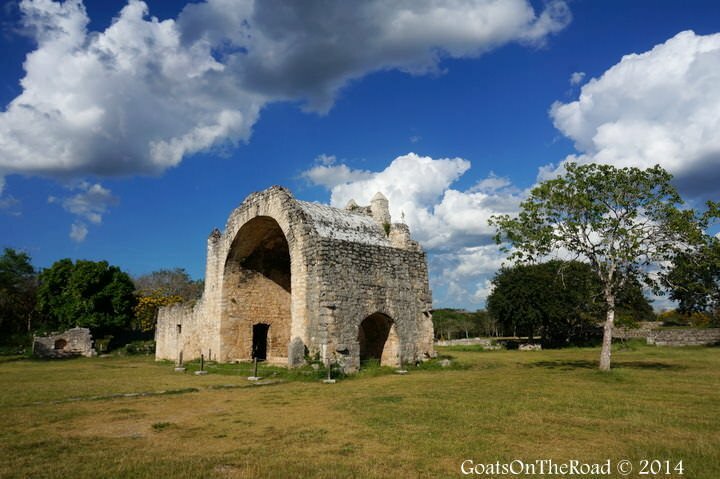 Nestled far away from the busy roads of Mexico stands these off-the-beaten-path ruins. This isn’t your typical Mayan city and it’s special for many different reasons. The main temple here is called the Temple of The Seven Dolls, due to the 7 small, stone carved dolls found at this site during excavation. During the spring and autumn equinox, the sun shines perfectly through the doorways of the temple. The beams of light used to represent the beginning and ending of the harvest season for the Mayan people. Yet another testament to both their ingenuity and their knowledge of seasonal change. Another interesting feature of Dzibilchaltun is the Spanish Franciscan Church, which the Spaniards built in the 1600’s. This was the first time we’d seen Mayan architecture co-existing with Spanish structures. 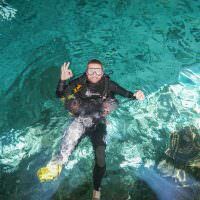 There’s also a lovely cenote here that is great for swimming. Not only is it beautiful, but when the cenote was first explored in 1957, urns, wood, pottery shards and human bones were found in the water! If you’re backpacking Mexico, we suggest pulling yourself away from the stunning white sand beaches of the Riviera Maya for a few days. There are many amazing things to see inland and those who make the effort to venture away from the water won’t be disappointed! 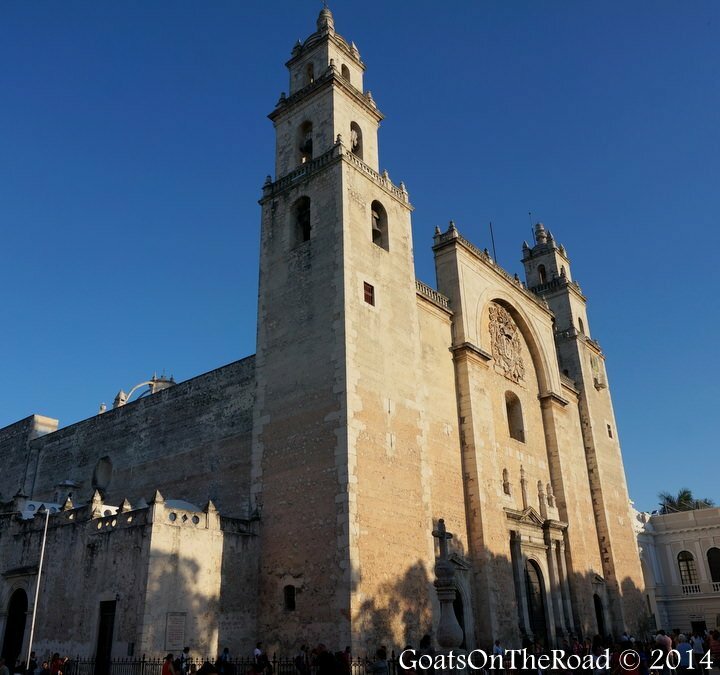 Have a look at our quick video showcasing the sights around Merida! I may have mentioned this in comments on your site before, but I lived for three months in the original Merida in Spain, teaching English! When Zab and I finally make it to Mexico, this Merida is definitely on my list, to see how it compares. 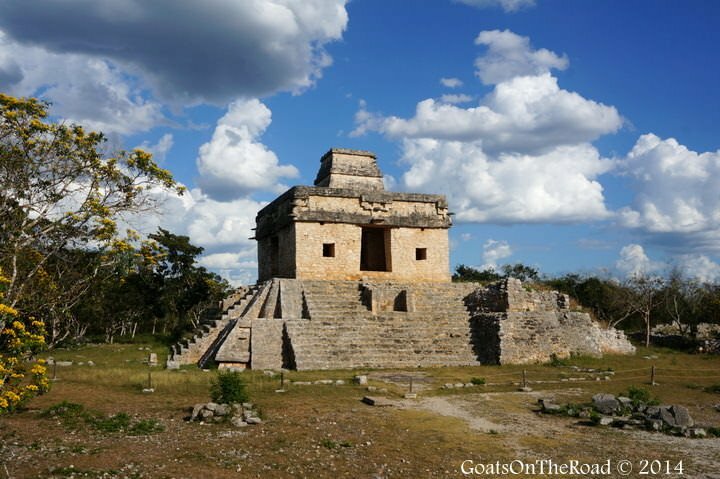 Looking at this post, though, I dare say the Merida in Mexico looks much more exciting and happening than the one in Extremadura…even though there are no Roman ruins in Mexico! Hopefully you guys do get to this Merida. We found that there were so many awesome day trips nearby and lots to do in the actual city. 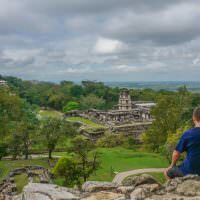 There may not be any Roman Ruins, but there are Mayan ones! Looks like a great place to take a break. I have yet to explorer eastern Mexico so will keep this gem in mind. Merida certainly does seem like the perfect base for the region! What a great selection of attractions! I’d love to visit some day. And yes, I know what you mean about Central Asia – it’s exciting, but it’s not exactly a ‘holiday’ – you might well need a break just to recover from the region! Yep, after bumping around in the mountains of Central Asia, it was nice to come to Mexico! haha. Merida was a great city to base ourselves in, I’d recommend it. Merida is a big town, but there is also a lot of appeal here as well as many close by day trips! Thanks. The city itself is quite large and loud, but there are some lovely quiet areas and amazing day trips. Make sure to see some, if not all, of the surrounding ruins! nice post, thanks for inspiration. I am visiting Merida this coming January and want to use the city as a base to explore the area – would you say 5 or 6 nights is too much? I’m mulling a trip to Merida and this information is super helpful. In fact, I think you’ve inspired me to push the button and buy the plane ticket. Thanks!